�	Is the 24�x30� fire box well proportioned to the size of this cooker? �	How far should from the top of the cooker should the fire box be? Of course the my first big challenge is to cut this tank, for better looks I want to cut the end weld, cut two feet off and weld the end back on the cooker�the problem is all the cutting, I don�t have a plasma cutter so I�m going to rely on either a sawzall or a large metal grinder, I'm undecided here! 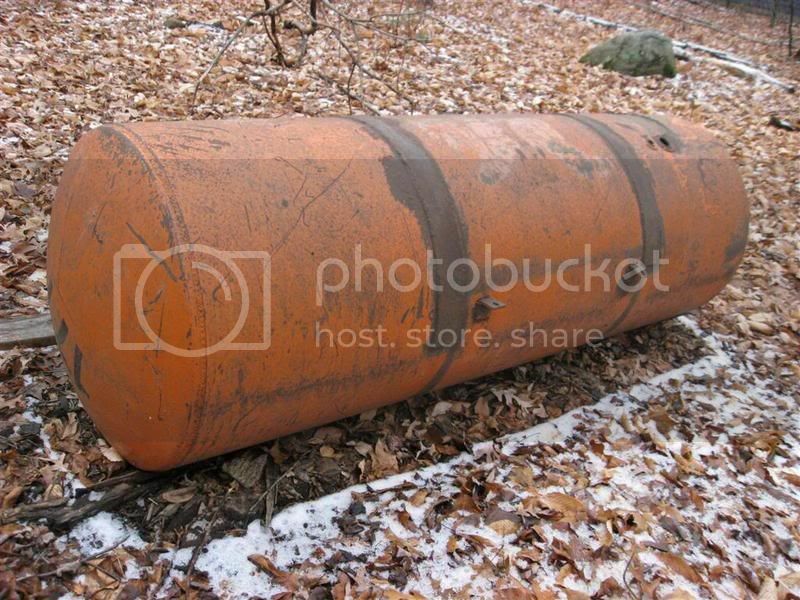 At any rate, here�s a pic of the tank sitting on my back yard. Any comments w/ hints will be appreciated. Well, to be honest a 4 foot cooker is all I need, I just want is a cooker big enough to cook a small hog once or twice a year, smoke my home made sausage and entertain my friends and family every now and then. So a 5 footer is already a plus. well I hate to be the barer of bad news here but that will not work at all. being the kind of guy I am, send me your address and I will remove it at no charge at all to you. Yes that is right, I am willing to rmove that awful thing from you sight and spare you all of the pain and suffering of trying to construct a smoker with inadequate materials. personally, IF you are still willing to attempt to "put lipstick on a pig", I would say the firebox is fine. Like Milt said make it full sized..... then use it for a while and sell it. Then get some more smaller pipe and make the one ya really want. You`ll have some extra cash and more build time to decide if thats really the style of cooker that trip`s your trigger (so to speak). Reverse flow cookers are log hogs and take a bit longer to heat up at first from what i hear. Kinda be a shame to hack it all up beins its in such nice shape as it is. It would be a lot of cutting and re-welding. Do what you want. Bigger is better, but if all you need is 4-5 ft than go with that. I have a few questions for you. 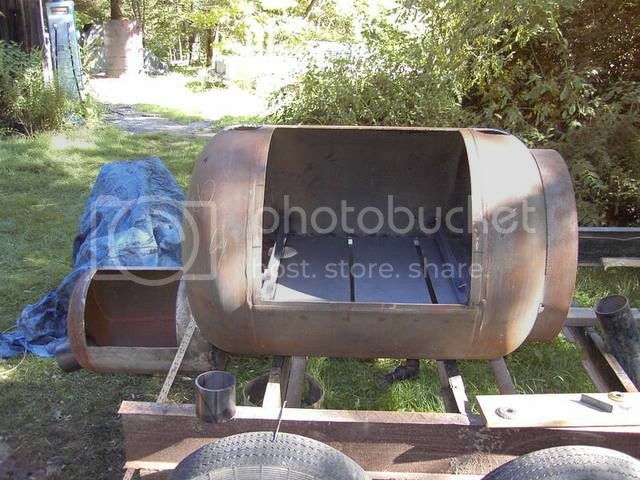 1. are you going to cut it down o have a 5' cooking chamber and use the left over for the firebox? 2. Is it going to be trailer mounted? I would cut it with a cutting wheel on a 7" grinder, it will be s straighter cut than with a sawzall, atleast in my opinion, but will require alot of cutting wheels. I built mine with tuning plates, but not reverse flow and it is easy on wood and has even heat, but it is also 3/8" thick, i do not know if thats why or not. I'm not exactly sure how your tank is constructed, BUT I just cut open a propane tank with a 4.5" angle grinder. Took a while since the water inside was spraying all over me, so I let it drain a bit, cut a bit, drain a bit, cut a bit...you get the picture here. As far as cutting the welds off, if it's similar to mine, bad idea! That was also my original plan, but after looking at it, I noticed that the endcaps had a portion of straight cylinder before they began the curve to make the dome, so I decided to cut it right at the beginning of the curve and glad I did. Once I got her open, I noticed that the main cylinder of the tank had been rolled from flat plate and welded, then it was "flanged" about an inch so that the endcap could slide over it, like a pipe cap, then the end was welded into place. The main "tube" or body is 24" diameter, but where it attached to the endcap, it was only 23.5" diameter. In other words, to cut the weld, I would have had to cut 1/4" steel X 2 (main body and endcap) + depth of weld bead for a total of over 1/2". It took 4 cutoff wheels on the ginder as it was, just to cut half way around the tank (24" diameter), then across and around the dome at the midpoint. If that's confusing, I cut half the dome off, or 1/4 of a sphere. You might just consider cutting the tank at the 2' point where you want to start your firebox, offsetting it, tacking it and adding some plate steel to seal it off. Also, be sure you've researched the "safe" (*er?) methods for cutting open a container that was filled with fuel. Like some of the others, if space constraints are not an issue leave it in one piece. I've fired my big cooker (40"x 8 feet) for one slab of salmon on occasion! Do the layout for your door opening, chimmney, drain holes, firebox opening(s) etc. Have a pro with a plasma cutter do all of the cutting. Faster, in some cases cheaper, and you are not breathing in all of that cutting wheel dust. I myself would build a DP clone or something real similar. 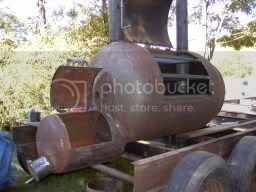 I like flat topped firebox's, and use mine for keeping beans, chili, greens, etc hot. Also, if you are unsure of your design, tack weld the firebox and chimmney into place. Check for draft, and then final weld. Much easier to cut tacks and make changes if things are not working properly. LOL... I've been known to fire up either the offset listed above or my other one which is 8' x 48" for just a couple slabs before... sometimes a fella just wants to play with fire! I agree wit txfire about those end cap welds. You will spend more time cutting, grinding, cleaning and re-welding that into a 5 footer than you want. Those large tanks are much harder to find and more valuable than 4 or 5 footers. What you are about to do is like cutting up the Hope Diamond to make a few pinky rings. Either way, you will have a fun project and great smoker so please post lots of pics. I hate you guys �..you convinced me, I�m not cutting the tank! I�m still planning a dual stack design and tuning plates plus interior dampers so I can operate it either way, and since I have extra room I�m contemplating a single or multiple removal tray, rotisserie system for the rear end half. Ok, the original plan was to use 24� of the tank for the fire box ( 8.54 cubic feet), Now that I�m building a fire box from scratch should I increase the fire box to say 28x24x 24, (9.3 cubic feet) ? Follow this link, enter your dimensions in inches and it will tell you what size to make all the openings/length for your stack, etc. As far as your firebox, I was told, on this site, that your firebox should have about 1/3 the volume of your cooking chamber. If you need help calculating volumes, just let me know, math is one thing I understand pretty well. I fugure my cooker is roughly 30 cubic feet (84x28 round plus the end caps) so if a third of that is needed for the fire box, I'll build a 28" (same as the cooker) x25x24 which is 9.7 cubic feet. or reverse flow, the stacks extend down to the bottom shelf. I have tunning plates that move for reverse flow or regular flow. I think 24" is good too. You can make it out of a 4x8 with minimum cuts and have some left for tuning plates. When you get to making your firebox I recommend that you have the metal cut to size at a shop instead of trying to cut the pieces with a saw or cutting wheel. I just finishing up mine and having the pieces cut square by a metal shear made welding it up a breeze. If I had tried cutting all of it with my 4.5� cutting wheels it would have never been as good. Best of luck with your project. Mine has been more work than I expected but it's fun seeing it start to come together. i have a homemade reverse flow. I don't think it is a log hog. I burned about 9 pieces for a 7-8 hour cook time.